Dry off or warm up with this Zoocchini Swim Coverup! 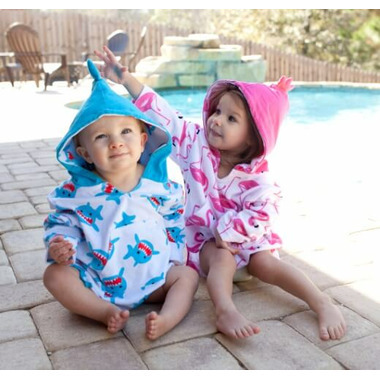 A must have for lounging by the pool, beach or play, ZOOCCHINI Coverups are long sleeved, offer a roomy hood and front pocket with whimsical designs! With a super soft & absorbent terry cloth fabric, your baby will not only be protected from the sun but will remain snug and warm after swim time! 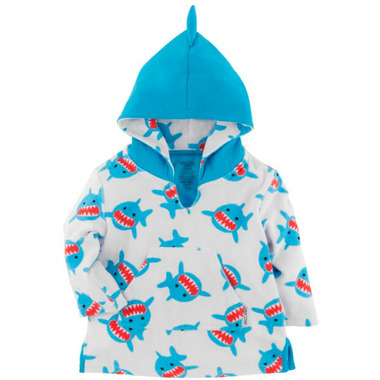 The hood is uniquely made with terry on the inside to dry off and keep their wet heads warm, with a soft jersey in fun pop colors on the outside with 3D ZOOCCHINI animal features. These cute designs will excite their imaginations and enrich their lives with play! I havenâ€™t used it yet but appears soft and comfortable. However, from the picture I was expecting it to be longer since itâ€™s called a â€˜cover up.â€™ Itâ€™s actually a shirt made out of terry cloth. For reference, my son is 20mths and is very small (3rd percentile range) and this would barely cover his bottom.